KBShimmer has created 12 polishes with inspiration from the KBShimmer blogger team, rounded out by 2 polishes dreamed up by KBShimmer Owner, Christy Rose. “Working with another person to create a polish based on their vision, their inspiration photo is always one of the hardest, but most rewarding things we do. That moment when you know you matched what was in their head, that is the best!” says Rose. Gaby from LacquerLoon sent us some amazing photos to work from. Rich chocolate, warm coffee, and glimmering clothes in shades of brown, copper and gold inspired this glitter filled shade. Near in finish to our Mega Flame polishes, this rich brown shade is filled with copper and gold holographic micro glitters for a polish ideal for autumn. I love a beautiful glittery brown and this fits the bill! Lisa from Cosmetic Sanctuary knew she wanted a deep vampy color burgundy red in our Mega Flame finish, and we delivered! This almost plum color polish is loaded with holographic glitters, with hints of maroon and aubergine for the ultimate sparkle. For a fun manicure, pair with Let’s Fang Out! Super sparkly when bright light hits the glitter and purple! Can't go wrong with this shade! Bonus shot of it, because why not? Sam from Sam Nailed It posted a stunning picture of deep burgundy vampy lips as her inspiration photo for a crème polish. I knew with the glittery polish from Lisa in the same shade it was a perfect match! The cream polish is almost a plum color, with hints of maroon and aubergine, this is the perfect autumn crème! 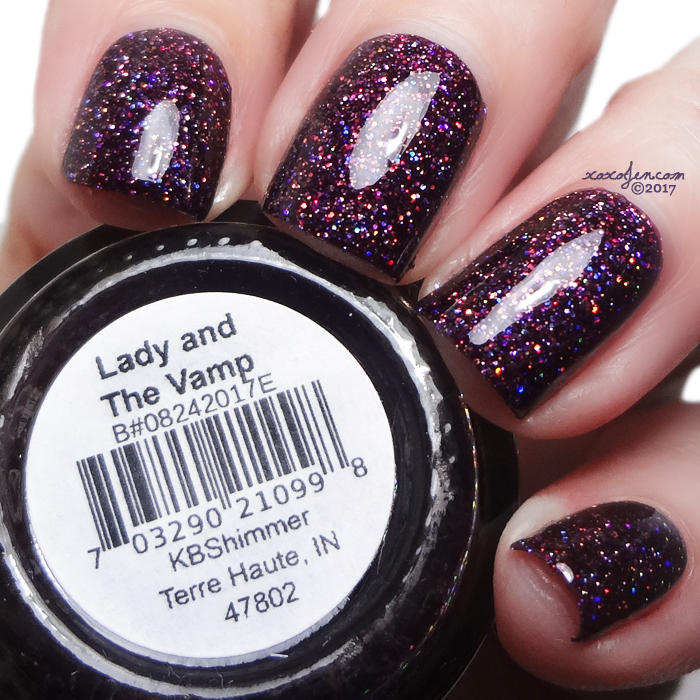 Super vampy, super rich almost black shade of burgundy. How stunning would this be worn with a black dress and glittering jewelry? Caramel apples, butterscotch, changing leaves and gourds signal that fall is near. This creamy butterscotch shade is made for fall. Pair with your favorite sweater, a pair of brown boots and your latte, and lets go head out to enjoy the crisp weather that only autumn can bring. Definitely an unusual shade of yellow that needs to be in your collection! When Valesha from Peachy Polish sent us photos of her inspiration, a copper tub and terracotta pots, we knew that fall was near. This terracotta, near pumpkin shade is filled with a subtle copper shimmer, which gives this near crème polish a sophisticated glow to it. The shimmer in this is like a hidden shimmer that adds depth and soft glow. I wore two coats with topcoat for opacity but may have gotten away with one. Judy from Beauty Judy was inspired by the dark night sky and the stunning hues of the Northern Lights. This shifty shade is the aurora borealis in a bottle. 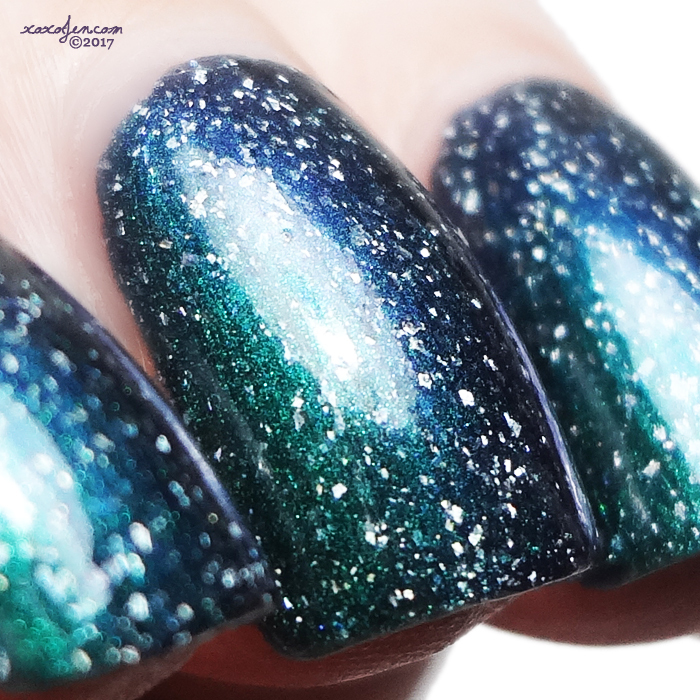 Filled with holo flakes, this polish shifts based on viewing angle from an emerald green, to a deep indigo purple, to an almost navy, for the perfect sky inspired polish. What a shifty polish! I didn't have to hop on one leg and hang my tongue out just right to photograph this. Usual lights, usual pose - that just doesn't happen with multichromes for me. And the colors of it are absolutely stunning - all of them are seen in the photos. How it looks here is how it looks in most lighting. If unicorn pee was glitter, this is it guys. Must have polish! One of Christy’s obsessions is rose gold, from phones, to jewelry, to wine, rose gold is life! This softly pink, near copper shade is the perfect match for those that like to stop and smell the rosé! 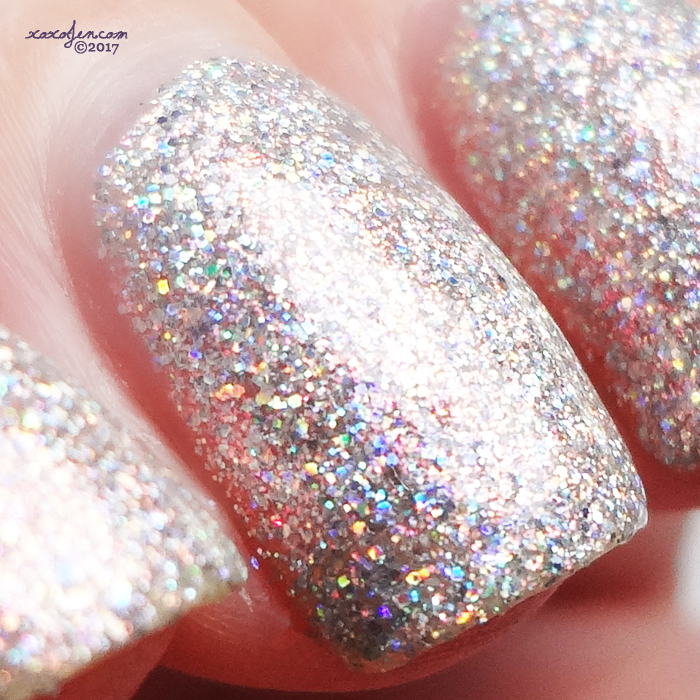 A favorite of mine from this collection because...HOLO! Super vibrant rainbow, even in dimmer lighting, that purple in there tho!! Lovely Mishra from Nail It Lovely asked us to be inspired by rich gold tones and soothing shades of olive. 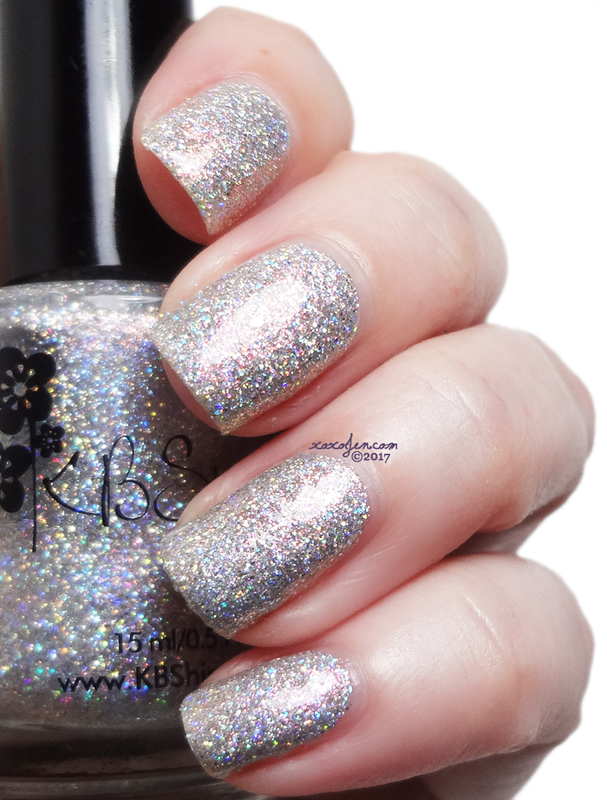 This polish in our holo glow finish is the perfect addition to your fall wardrobe. 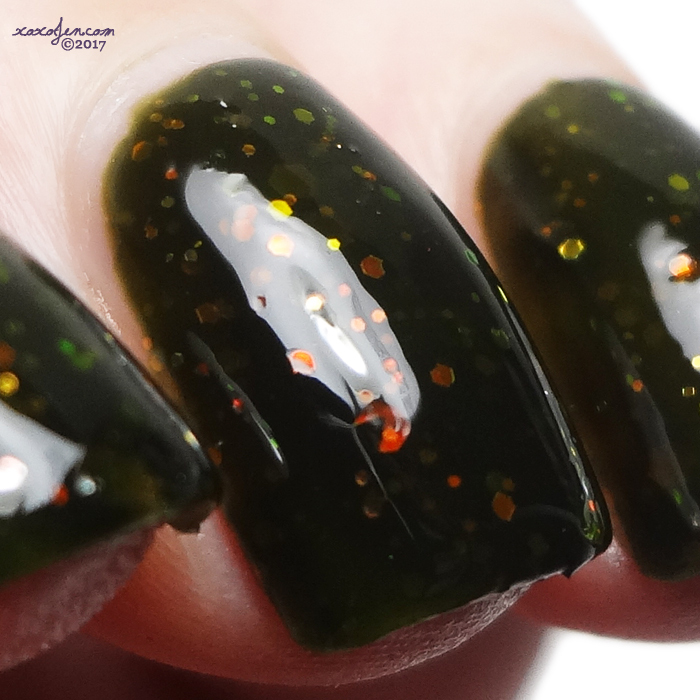 A deepened olive color, this polish shimmers with holo glow flakes and a golden flash that shines in the light. Yes! Olive lovers rejoice! 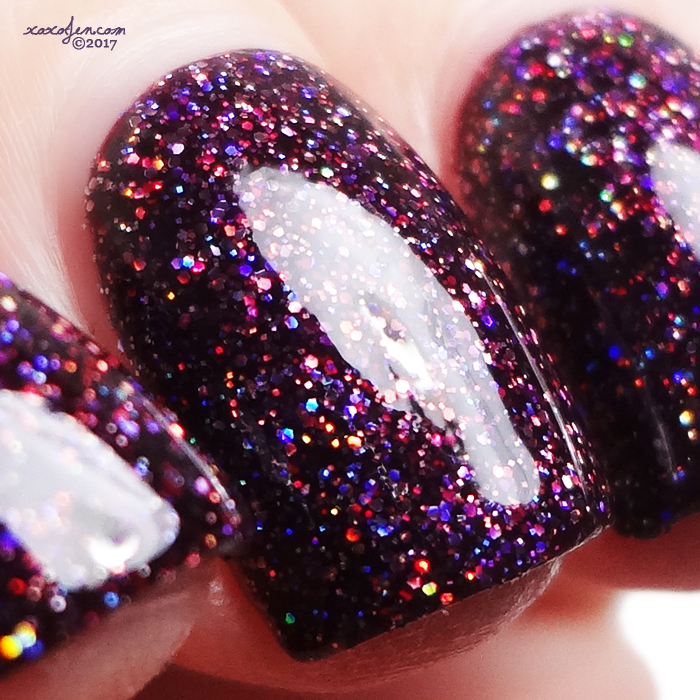 Beautifully done in KBShimmer's super popular finish. What's not to love about it? When Antoinette from aricedotcom gave us beautiful photos of autumn leaves against turquoise skies, I knew I wanted to create a soft sky blue polish to bring a pop of color to fall. This creamy shade is loaded with a peachy copper shimmer, for a soft shade that will make you imagine jumping into leave piles on a bright fall afternoon. Reminiscent of summer skies to me, I love wearing shades like this through the fall and winter. I find it to be quite uplifting! Amy from McPolish gave us beautiful photos of nature at its shining best, from a softly glowing starry sky, to shimmering opals and natural stones. 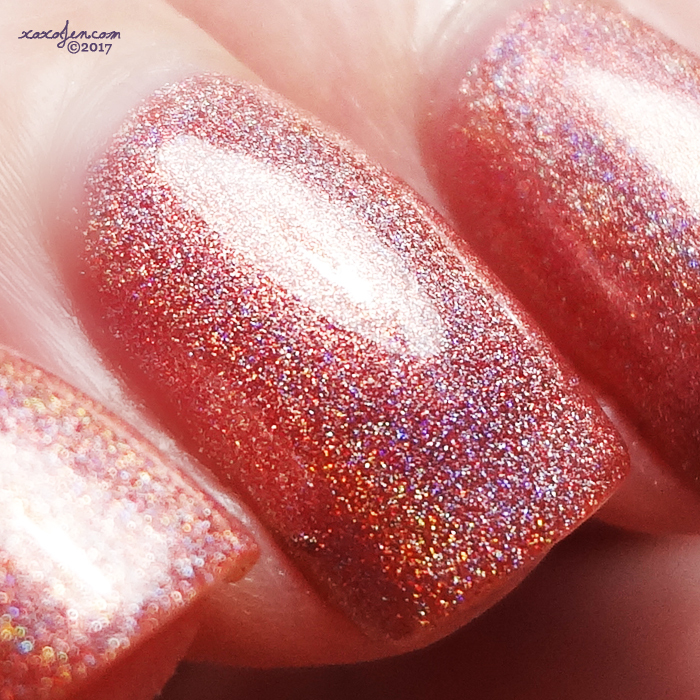 This super sparkly polish is filled with micro and small holographic glitters, and a red shimmer that shifts to copper, gold and pink. This holographic polish feels like wearing jewels on your nails. Like diamonds dripping from your nails! It has a really nice copper shimmer throughout which makes this polish unique. The shimmer is more apparent in softer lighting, but looking closely at the photos, it can be seen. Two coats with topcoat and this baby is opaque! Alicia from Delishious Nails gave us a stunning palette of rich, deep blues, turquoises, and teals to work from, and I knew this would be a perfect fit for our Holo Glow finish. A jewel toned teal leaning blue, this polish is filled with holo glow flakes that accent a strong turquoise shimmer that makes this polish shine bright. Michelle from Ehmkay Nails wanted a polish that expressed her photos of the holidays in NYC. The steel of the high-rise buildings, the twinkle of the holiday decor, and the glow of the violet up lighting inspired this crelly polish. A light gray color, this polish has a soft violet shimmer, while pops of rainbow metallic flakes give this shade perfectly NYC look. In total love with this dove grey crelly, the shimmer absolutely glows on the nail and those flakes! Jen from My Nail Polish Obsession is a West Coast gal, so fall for her is full of beautiful flowers and bright colors, just like her inspiration photo. Those vibrant floral photos spilled into this bright fuchsia pink shade. Filled with micro golden flakes and shimmer, this hot pink polish will make you wish for warmer days. Stunning gold shimmer contrast against the pink creamy shade, very well done! I wore two coats, but may have gotten away with one. The fall collection is the first to feature KBShimmer’s new 5 free polish base. Some of the polishes I've swatched prior to these featured the new base and I have enjoyed it. The new formula wears well on me without chipping, is easy to apply and has a smooth almost buttery feel. The entire collection and many more beautiful colors are available now at the KBShimmer online store. I agree, they are unique and beautiful. Thank you for the compliment! Some really nice colors int his collaboration collection.